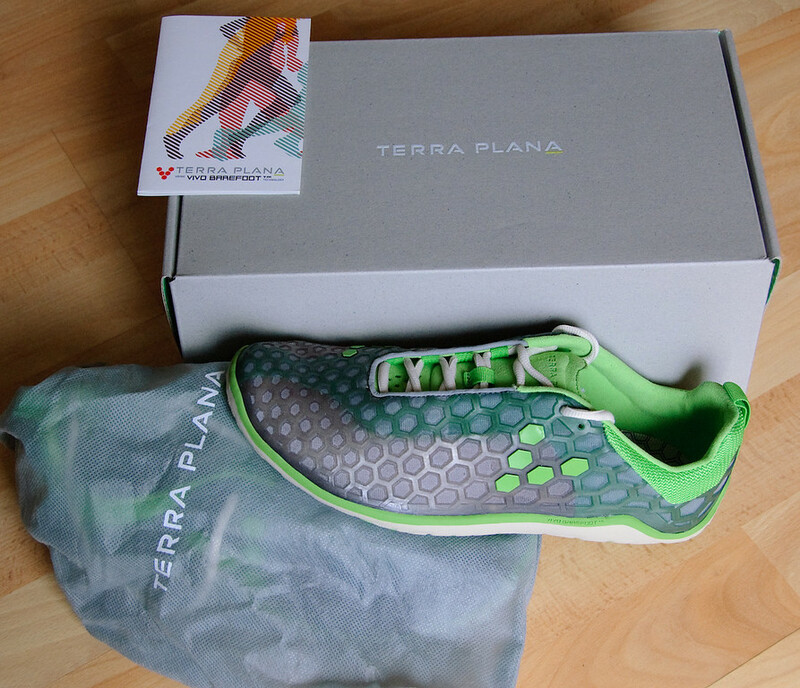 Following on from my review of the VivoBarefoot Aqua shoes by Terra Plana, I've been kindly sent a pair of the much talked about VivoBarefoot Evo running shoes for review and critique and fast approaching two months after receiving them (I've been a busy boy) I'm finally getting around to documenting my experience. 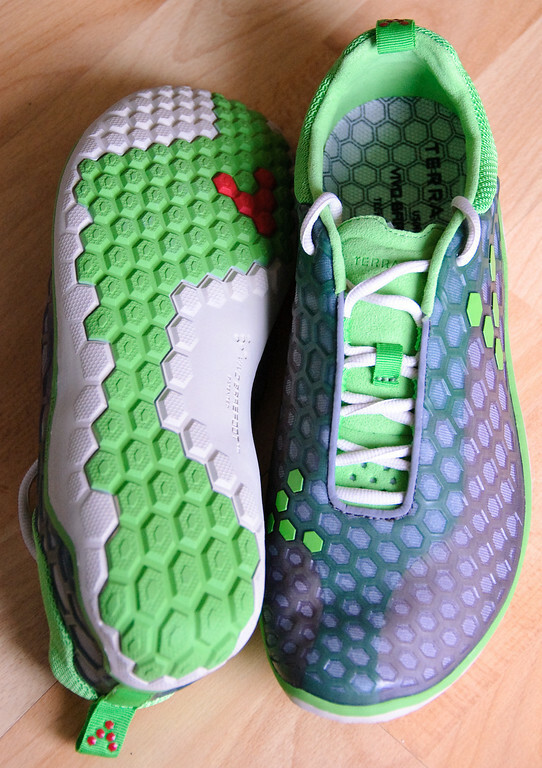 First thing you'll notice is, unlike a lot of it's competitors, the VivoBarefoot Evos actually look like the running shoes you're used to seeing. They have a very low profile, thanks to the very thin soles, feature a normal lacing system including the two eyes at the top so you can use your favourite lacing methods and generally don't look too dissimilar to a pair of racing flats. You may also find yourself a little disappointed by the fact you don't get much in the way of padding, foam, rubber and fancy torsion or motion control systems for your £100 ($160). With the initial observations out of the way, it was time to try them on. I didn't have much of a sizing "experience" with these as the lady who sent me the Aquas already had my size so the Evos came pre-sized and are a good fit. The sizing of the Evos appears to be consistent with that of the Aquas, however you may want to get a size smaller if you're going to run in them without the insoles. The fit itself is good. It's very comfortable with a relatively snug fit around the heel and midfoot and quite a spacious toebox, though not as spacious as the Aquas. I suspect this can be attributed to the fact they're trying to make these look like running shoes and a super-wide toebox like on the aquas may look a little silly. The only "issue" I have with the fit, and it's more of an observation than an issue, is that the soles have a slight arch; the marketing calls it a "sucked out arch area". Unfortunately, this can be felt when wearing the shoes. I only notice this because I've been spending so much time completely barefoot or in the Aquas in which you can't feel this. The arch isn't supportive in anyway so it's not going anything, however it's presence may lead to rubbing on longer runs. 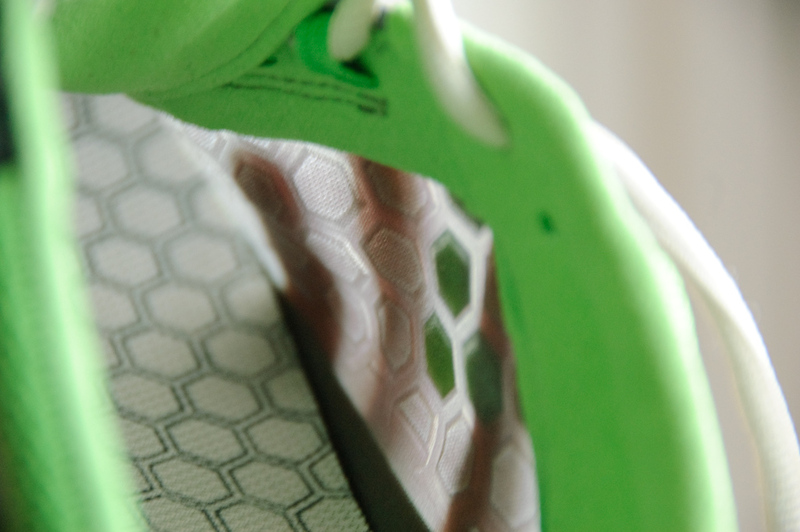 Removing the insoles reduces the feeling, but doesn't take it away completely. 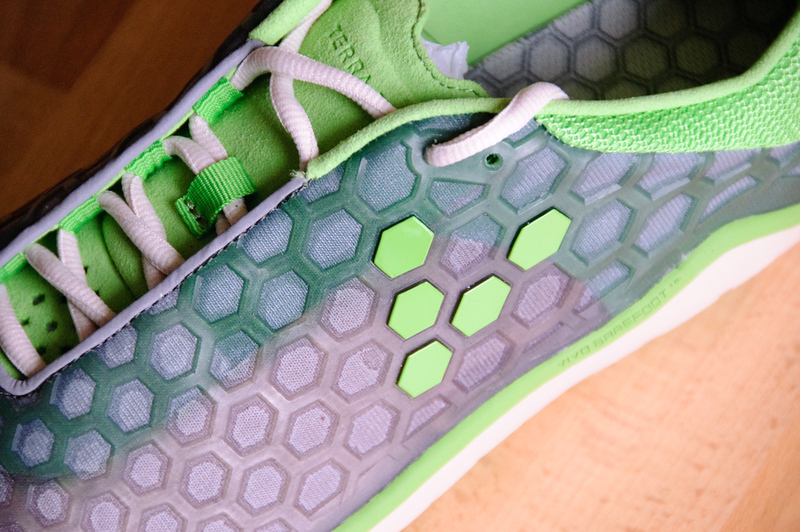 The Evos, like the Aquas, are immaculately constructed. There are no distinguishable differences between the two shoes (bar the fact one's a left and one's a right) and no signs of sloppy or rushed construction. They are relatively light and come in at about 271g with the insoles and 243g without (this is actually an average as the left weighs 10g more than the right for some reason) and there really isn't much to them. The sole is 1mm thicker than the Aquas at 4mm throughout with absolutely no heel elevation what-so-ever. The upper consists of a highly breathable TPU cage that is so breathable in fact that you can almost see straight through it. Naturally this means the shoes are not water resistant, but then again, which running shoes are? The sole of the shoes is a lot more rugged than the Aquas and pretty much all of the other minimalist running shoes on the market, however it does offer some additional grip in the wet and off road without too much loss of flexibility or ground feedback. What I couldn't answer by looking at the shoes was why they weigh so much when there's so little to them?. A pair of mid-to-top of the range racing flats come in at about 100g lighter. Maybe they'll lighten as they evolve. 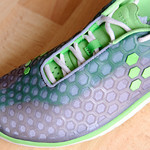 And finally we get to the part you're reading this review for: how do the Evos perform when you actually run in them? Very well indeed. 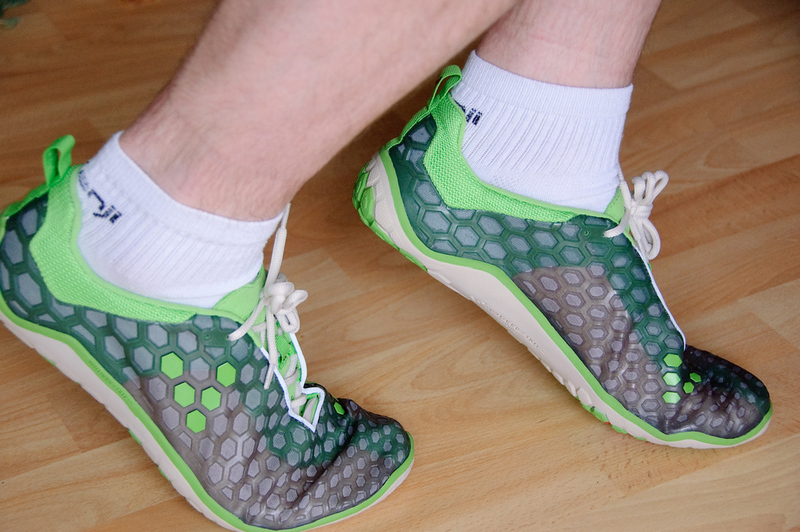 If you've run in racing flats, they perform just as well, if not better. Naturally, the shoes protect your feet from the friction and coarseness of the road and that's about it. There's no motion control, no arch support, no cushioning and no fancy gimmicks designed to make your feet behave like the manufacturer thinks they should. 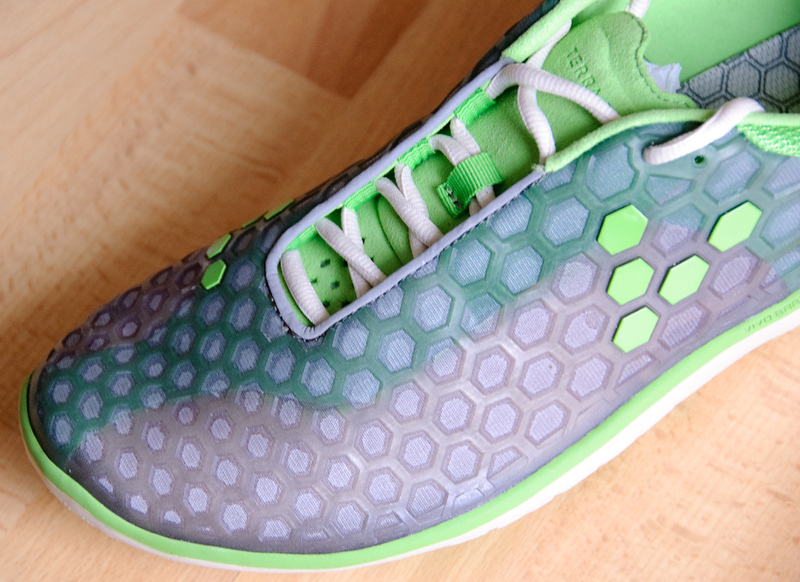 The Evos allow your feet to behave as your feet want to behave with as little intervention from the shoe as possible. The thin soles do a good job of softening the landing on some of the larger rocks and stones that may affect your stride when running barefoot, however they don't dampen things so much as to not give you any ground feedback at all. I'd say it's very close to what you'd get from wearing Vibrams with the Vibrams giving a slightly higher degree of feedback. That said, the slightly thicker and more rugged sole of the Evos trump the Vibrams when it comes to running on very stoney off-road paths. 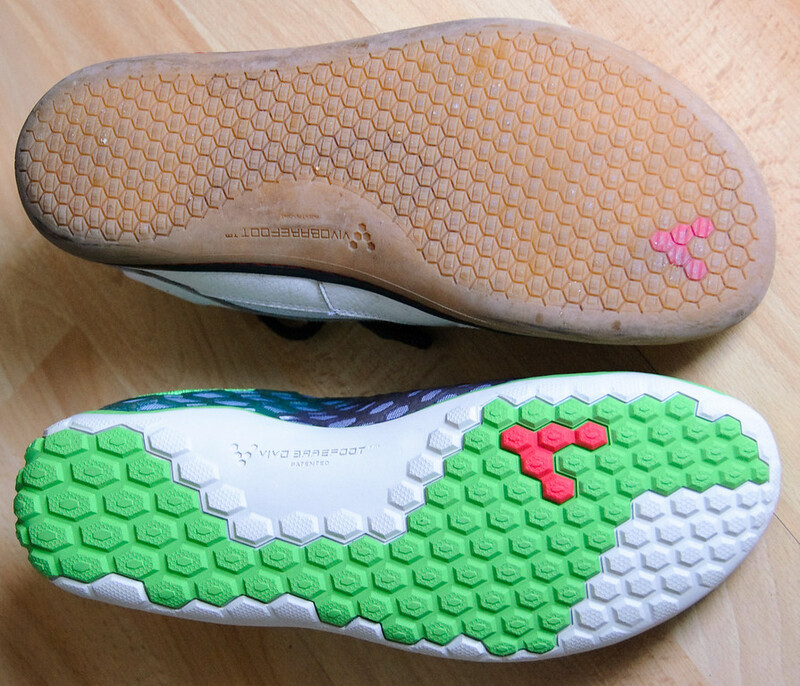 As you can expect the ground feedback is affected by the insoles. I've taken the Evos out a couple of times with and without the insoles and I prefer them without the insoles, mainly because I actually noticed my feet hitting the ground slightly harder with the insoles than without; almost subliminally searching for the feedback. This wasn't anywhere near as what I'd expect my feet to do in normal shoes, but given I've been running exclusively barefoot since the beginning of February, I noticed it if I concentrated. If you're coming from running in normal shoes or racing flats, you'll appreciate the slightly extra cushioning that the insoles provide. There is however one problem when it comes to running in the Evos: blisters. In my first run in the Evos, I developed a smaller blister on my left heel. I thought this may have been due to not running in shoes for a while, but it seems several other people have encountered this problem in their first few runs. The incidence of the heel blisters seems to subside as the shoes wear and I didn't get any blisters on my heel on subsequent runs. The second and most notable incidence of blisters, and this is certainly the most common issue seen, is blisters or bruising on the top of either your big toe or the toe next to it. When running, your foot naturally bends at the toes. 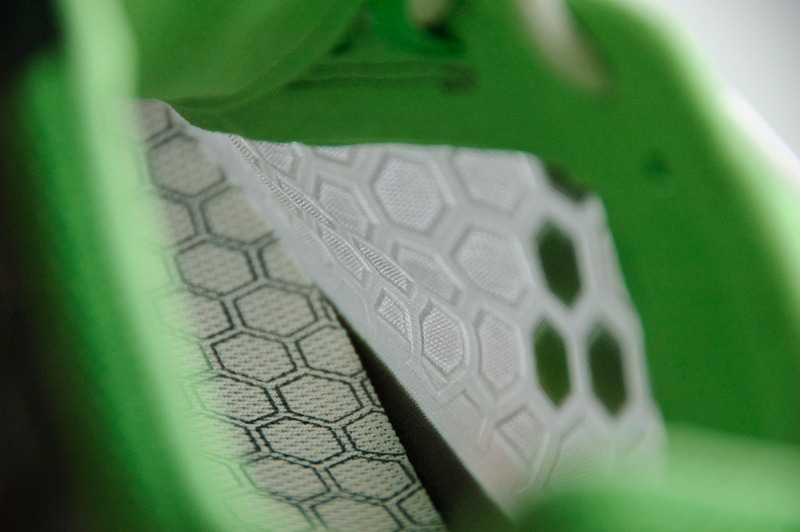 The TPU cage here creases inwards and presses against your toes. After several miles of this, you soon start to feel it and if you continue, as I did, you may develop a bruise and possibly a blister or two. Thankfully, Terra Plana have acknowledged both of these issues and have apparently been back to the drawing board to resolve this in later releases of the shoes. There's already talk on the haurache (note to self, I must make/get myself a pair of these) forum here of the later editions looking ever-so slightly different around the heel and inside above the toes than the earlier version. If you have one of the early versions, you may find using a bit of moleskin fabric on the heel and above the toes as detailed here will solve your problems. Hey, you could always try beg and plead with Terra Plana and see if they'll swap them. Superb quality build and design. Very thin soles throughout with no heel lift so the ground feedback is very good. Wide on the forefoot so your feet and toes can splay naturally. They look like normal running shoes so will appeal to the more conscious runner. Cost. Terra Plana know they're in a bit of a unique position in a niche market and have priced accordingly. Once competition picks up, I envisage the price of the Evos may come down. The early revision is likely to cause blisters on the heel and on top of the toes and thus may require modification. This con is probably moot given Terra Plana appear to have addressed this issue in later versions. Slightly narrow in midfoot, but this is likely to just be a personal thing. Whilst relatively lightweight, I can't help but feel they should be lighter especially. So all in all, these are fantastic minimalist shoes and definitely ones I'd recommend to anyone looking to move away from wearing traditional running shoes or any barefoot runner looking for a minimalist shoe to run in offroad or in the winter.